Returning to the Front Lines! When I first heard that Conquest 2 – Vyrium Uprising had arisen like a phoenix from the ashes, and had appeared on Kickstarter, I was insanely excited. I immediately used the contact form on the Kickstarter page to make a press inquiry…and received a reply from Eric Freaking Peterson (Note: Freaking is not his middle name….I hope…). You know, the guy who worked on the original Conquest: Frontier Wars, as well as Wing Commander IV, Privateer 2 and Starlancer? ;) To say I was starstruck was an understatement. ;) Despite my fanboyish excitement — or maybe because of? — Eric agreed to do a little Q&A with me, and you can read it after the cut, as well as look at two exclusive screenshots from Conquest 2. Enjoy!! Brian: Thank you for taking the time to answer my questions. Now, I have to be honest, after the first game came out — which I adored, I admit — a sequel was planned, and even a demo of it was released. Then…nothing. This left many fans frustrated at the time, myself included. If I may ask, what exactly happened to cause Conquest 2 to seemingly disappear, only to reappear a decade later? Eric: Great question and one which we will be addressing shortly in our Kickstarter campaign, but since you asked so nicely, you will get the scoop! Essentially we got purchased by Gizmondo, and RTS games do not do well on hand held devices, at least on the Gizmondo’s technology. They would do quite nicely on the new stuff out today and we are working on that as well. So it got tabled for a few years, while we worked on other projects – we sought funding for it, but as you could guess RTS games were not at the top of publishers “NEEDS” list so we were unable to get the funding and we all worked on it on the side in our spare (Yeah, what is that) time. Then Kickstarter came out and we jumped at the chance to make the game we have loved for more than a decade. Remember, even though the game came out 11 years ago, we released our last patch in 2006, I believe, we have continued to support it because fans have been modifying it and playing it for years, and it is the same reason we want to finish it, because we love it just as much. Brian: On a side note, what happened with the planned expansion of Conquest back in the day? Eric: We were going to do the other 2 campaigns and maybe add the Vyrium, but we decided that it would be better to just go for the full sequel instead. Much more stuff to add, much more game play, an expansion pack at this late date would be kind of silly. Brian: Now, moving on, how far after the events of the first Conquest will this sequel take place, and does one need to have played the first game in order to jump into the sequel? Eric: 40ish years into the future, and folks will be able to jump in and play this one as it’s own storyline. We will get them up to date on the original, and maybe they would even be encouraged to try it out after getting Vyrium Uprising. Brian: The story in the original Conquest was a very well-written, believable and gritty story of possible future warfare, which unfolded very naturally in the campaign. How will the story unfold this time, and are the same folks behind the original story working on the story for the sequel? Eric: Yes, the same folks and thanks for the compliments, we like working with as many of the same people as possible. Jason Henderson and Eric Peterson were on the first one, and now we add in Mike Morlan who is an excellent story teller as well, and we expect this story to be better than the last. Brian: One of the things I found both innovative and well-rounded about the original game was the interface. Juggling multiple ships, planets, supply lines and so on wasn’t the chore it easily could have been, and that’s a very big achievement. Will there be any enhancements to the interface in the sequel, and if so, could you detail some of them? Eric: The interface will be undergoing a complete makeover, but with added functionality, for things like new admirals, fleet formations, special hybrid weapons and tech, lots more to do, but still all contained on one sleek interface for each race. Brian: One of the beauties of the original game, I think, was its character. Each race was specific in look, feel and design, and you could also enlist specific characters by way of admirals to make your fleets more effective. What’s being done to retain this sense of character, and will we see more examples of it in the story, ships, in-game characters and so on? Eric: This is an excellent observation, we wanted each race to have it’s own style of warfare, and the admirals to reflect that and give players ample opportunity to play the game the way they liked to play it. We will of course be continuing that in Vyrium Uprising. The Vyrium are more of a slug it out race, so their leaders will reflect that, and so will their tactics. And of course the in game characters will reflect their particular race or personality, that is some of the fun stuff to do in making games, adding in that bit of flavor that makes the game unique. Brian: Even today, Conquest is a very lovely game to look at, along with being very manageable by using a 2D plane. How has the engine been improved for Conquest 2, and can you detail its capabilities (i.e. ships on screen, resolutions available, etc)? Eric: The engine has been improved, and we are able to handle a LOT more ships, I think the first one was Direct X 7, and this will support the latest version, as well as the new video cards. The engine was not what was holding the amount of ships back it was the 3d graphics cards back in 2001, now they are off the charts, we should have thousands of units slugging it out in 3D glory with explosions to spare! Brian: I have to admit, I LOVED the music in the original Conquest, composed by the fantastic James Hannigan (I’m listening to it as I type this). Is there any way Mr. Hannigan will be working on the music for Conquest 2? I ask because not only would that be AWESOME, it would help maintain the atmosphere of the original game from a consistency standpoint. Eric: We also want to work with him again, his composition was fantastic, if we get the funding from Kickstarter he is one of the guys that we will set to work on making the music even better. Brian: Now, if I had one complaint about the game, it was that there was little to do for the single player outside of the campaign (I’m not much of a multiplayer guy at all). That being said, will there be any other single player options this time around besides the campaign, such as a skirmish mode on random maps, for example? Eric: Uh, the original has that feature, you just hit the multiplayer lobby and set up for enemy AI, there are even 4 levels, and in the last patch we included a “Nightmare” AI level, Skirmish is one of the best things about CQ, and we plan to amp it up all the way to ELEVEN in the sequel. Brian: Speaking of multiplayer, could you detail the multiplayer functionality found in Conquest 2, like game modes, players per game, etc? Eric: 8 player, can be 1v7 or 2v6 etc..etc..etc…any type of configuration, there will also be new game types like Capture the flagship and Home world defense to name 2. Brian: Besides what I’ve already asked about (i.e. interface, engine, game modes, etc…), what would you say are some of the major differences between the original Conquest and the sequel? 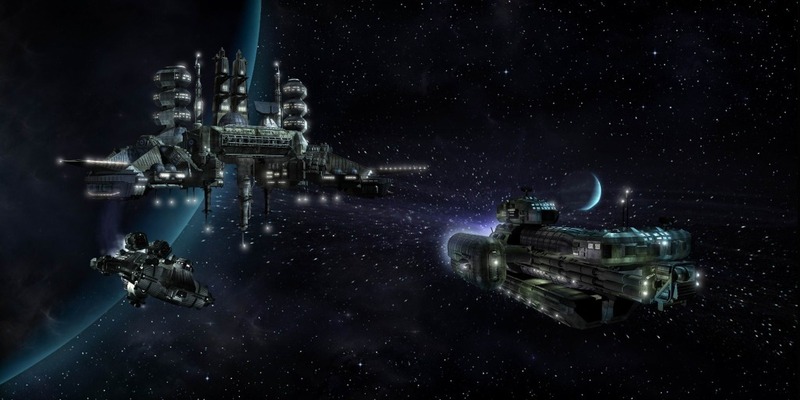 Eric: The Vyrium, Admirals that can be upgraded and trained, fleet formations, moons, black holes, hybrid ships that combine technologies from 2 races – and the number 1 thing everyone asked for, to blow planets up….but if we allow that, you have to allow terraforming, right? RIGHT? Brian: Now, if Kickstarter doesn’t work, and the project isn’t ultimately funded, is there a plan B for getting this game released, and if so, what is it? Eric: No plan B sadly, ATM, but if someone wants to write us a big check…!! Brian: Finally, if you could say one thing to excite fans old and new about Conquest 2, in order to help with your Kickstarter campaign or in general, what would it be? Eric: It would be that our voices need to be heard, that publishers will continue to feed us the same game over and over and quality genres like RTS will fade away, not because they are not fun, but because there are none available. And instead of spending $30-$50 and getting 100s of hours of game play, we are going to be nickel and dimed to death, but free or low priced games that require $5 here and $10 there, where ultimately we spend hundreds, it is the oldest play in the book, keep getting folks to pump in that money, and screw gameplay. That doesn’t sit right with us nor should it for game fans the world over, even if you don’t support us, please support others on Kickstarter, because that is the only place we folks as consumers can REALLY be heard. Well, in theory this can be interresting, I just think they put the goal to high, it may be just pure psychological, considering what some games pull in, but setting it as low as you possibly can may be a smarter approach.. The goal is actually quite low for a AAA title, like Conquest. The first one cost around $7 million and we already have more than $1 million into the sequel. The problem with seeking a lower threshold was that we would not be able to deliver at that smaller amount and that would be pretty poor of us as human beings to take money and not deliver. So, we set it at the lowest point we could deliver a triple A title and if it is simply too early in KStarters life to support that, then so be it. Can’t hurt to try though, right? Welcome Timmaigh, and thanks for the kind words! I’m glad you enjoyed it!